Sometimes I love the things that my Google Reader shares with me from down the hall … this afternoon I jumped into my feeds for the first time since very early this morning. One of my favorite things to see is the little new article indicator next to my ETS folder. I love to see fresh content from those in my own team … just warms the heart. There were a couple new ones today, but the one that caught my attention was from my colleague, Elizabeth Pyatt. Elizabeth is an Instructional Designer in our group who brings great insights into literally everything we do. Elizabeth was instrumental in starting and executing our blogging community hub so she gets the community thing in a big way. Her post today really made me step back and think. What is funny about it is that her post is about a whiteboard. You see, about a month and a half ago the whiteboard we ordered for the Cafe ETS space showed up and it was way too big. Instead of sending it back I asked that it be installed in our hallway so it could be used for ad hoc conversations, announcements, or really anything else people wanted to use it for — within reason I suppose … my general rule for anything around the office is to not spew hate (a good rule to live by). I’ve watched the whiteboard since it went up and it has been used for all sorts of things — pictures of me, polls, announcements, and more. I’ve liked it all and haven’t given it too much thought. I did notice when we first had it installed that someone asked (via the whiteboard) what the policies governing it are. I didn’t respond, but did put a fictitious item on our all staff meeting agenda to address that. We didn’t. Elizabeth notes some things that only now am I growing aware of — people want to know what it is there for. The funny thing is that I really don’t have a concrete answer. It is there to be there … if that is too abstract then so be it. Chalk it up as another grand experiment. The other thing she notes is the Twitter stream running on a display in the same hallway. We all tweet with our personal accounts and they end up showing up in our hallway. I usually always enjoy reading them when I get off the elevator and I do feel like it provides an interesting insight into our organizational DNA. But as Elizabeth points out, some of the tweets are probably not aligned with our organizational perspective (maybe … not sure about that). 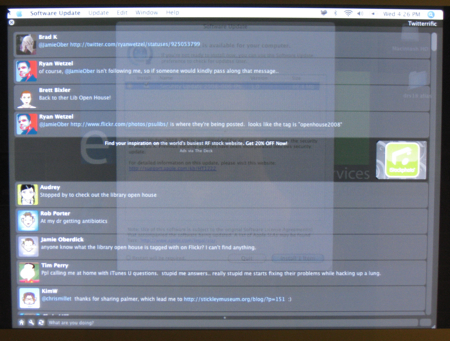 Again, it is an interesting look at social interaction … another grand experiment. I am honestly intrigued by the way we are all navigating both online and physical social platforms — and yes, I just called the whiteboard a social platform. So what the hell is this post about? Well it has a little to do with who we are as a group and the kinds of things we are all thinking about individually — and really how they add up to form an organizational identity. It is also about how we are walking in the open without the old rules — whatever they were. The new school technology of Twitter has brought a strange view into the collective (even if not everyone contributes to it), while the whiteboard seems to have caused more questions. I’m not sure if we are more forgiving with our use of the new school stuff or not. I do know one thing I can answer with certainty for those who are wondering — I am not the one erasing stuff. I am leaving that to the community to deal with … if I erased I would violating one of the things I believe in — communities self correct. Even on whiteboards. Would you say you generally feel there’s no policy needed? I think that its an extremely complex issue and touches on many things. For instance, I don’t think we need managers, because we shouldn’t be hiring people that need to be managed. We shouldn’t be hiring people that need a policy, either. But what do you do when the correction isn’t fast enough? When a clever but sophomoric action at the wrong time represents Penn State indelibly to an outsider? okay by me, but I wonder how far up the ladder people remain okay “with those scamps.” And what the responsibilities are of leadership. If we’ve hired someone who would draw embarrassing images on our whiteboard just before Spanier pays his weekly visit… aren’t we doing a good thing by helping them understand the problem before it happens? Yeah. I know it’s just a whiteboard. but nothing is easy. Thank you for clearing up my most nagging question–why in the world did someone look at all the most favorable spots in the office for a whiteboard and pick between the 2 restrooms? I just learned that wasn’t the original spot chosen. I’m still reaching for some idea of what I would put there. At any rate, I can’t draw, so everyone can rest easy on that account. I have noticed over the years in the unit that various forms of “non-serious” forms of expression–completely unhateful and unpolitical–that have appeared in the office are short-lived, e.g., they are disappeared. Dave … difficult questions indeed. No, I don’t think there is a policy needed. Just as you say there shouldn’t be a need to hire managers — which I do disagree with — I do not think the people we work with need a governance policy to share thoughts on a whiteboard. If President Spanier did come through our offices I would be honored, not embarrassed. We do good work and that speaks for us. I guess I am trusting the fact that we work with smart people. People who understand what is and isn’t appropriate — BTW, those aren’t my rules, those are basic rules of citizenship. With regard to your second point, I do think it is critical that non-hateful behavior is modeled. Not sure how to say it, but I think it is important that *anyone* who feels put off by *anything* published on the whiteboard be empowered to erase it. If I had a policy it might be that everyone owns it and can take control of it. It is our responsibility to help the entire group understand what is and isn’t appropriate — not managers, just the people around the office — to help everyone else look at the space as a public, yet very representative space. It is a strange conversation to have, but it is happening. Mary … you do have to admit that the spot between the bathrooms is a highly trafficked area! We have this strange physical division between the two sides of our floor and while the spot was a default, it was done to see what might happen. Lots of people spend time out there talking and I thought it might be interesting to see what emerged. Honestly, I’m not sure what *should* be there at all. Our walls are a living artifact of the work we do and I really want to continue to find ways for it to come alive — text, images, motion, emotion, etc are all forms of expression that we should work to share … and our walls are our gallery. Just my two cents. Thanks for the comment! 1) I do like to think that Penn State (even President Spanier) can handle a little bit of “quirky” commentary. One of the things I love to look at in the academic halls are the funky cartoons/jokes/discussion on the doorways. Hilarious stuff. I think it’s one of the key perks of an academic work place. 2) Paradoxically though, the line between “fun” and “not-so-fun” can be thinner than we realize. Going further out on my limb, I would say that the most heated threads ever caused on any academic listserv are due to someone making a off-the-cuff political comment (in either direction), and this is something that I saw happen on the whiteboard. I normally avoid discussing politics like the plague in the office – because I don’t know which nerve I will hit. The important thing to me is that regardless of what happens in a voting booth, I still respect what my colleagues do here in ETS. I agree on the political banter … especially at a time like this. Politics create very strange responses (and I am guilty of that) and might be better suited for the refrigerator door at home and not the whiteboard in the office. The Twitter stream is more vexing b/c it shows tweets from the public timeline. Quite a few people have mentioned the idea of appropriateness. In theory, people should know what is appropriate to say or write (or draw) in a work environment. The office whiteboard, written on using office markers, during office hours, in the office building with a nearly exclusive audience of office employees *should* be pretty cut and dry. 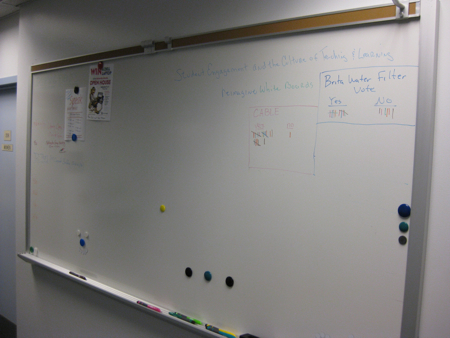 But the whiteboard (in this case) is old school – not just technologically speaking but in its solidarity of purpose. Now we have Twitter. Delicious. Flickr. Facebook. The Blog. Tools that are not by the office, of the office, or for the office. And yet they are all used IN the office. All of a sudden, the idea of appropriateness, or perhaps more accurately the context with which one would determine it, is gone. I wouldnt get political on an office whiteboard. The audience for the whiteboard is clear. The audience, purpose, and “appropriateness” of Tweets is not quite as crystal. Its ok that we don’t always like what other people are saying, how they are saying it or what they are saying it about. We’re not lemmings or beings of singular purpose. And as far as I’m concerned its ok to be uncomfortable every once and a while. That is part of community too. So, I was just thinking back to the comment I left here earlier this fall in light of today. For the first time, I decided to pin a small, lighthearted item on the whiteboard. Just a silly little screen capture from ANGEL 7.3 of a fake instructor’s user profile, where her URL showed she’d created a portfolio blog. I posted it around 10:00 a.m. and it had been “disappeared” by the time I returned from lunch. I’m thinking hard to try to determine which part was offensive. Mary … hmm, no idea. Maybe a big sign on the whiteboard that asks, “who moved my sign?” I don’t know. Put it up again and see what happens!